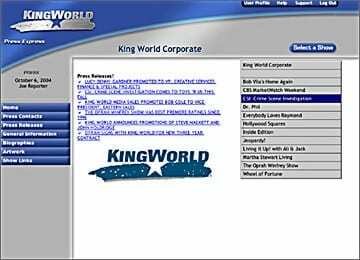 LionSky Media was selected to assist in the development and Quality Assurance of the King World Television Resource Center Web Site. 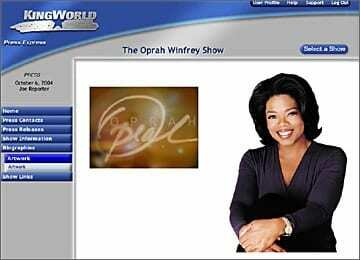 The site contains resources for the Press and Affiliate TV stations. Items include all graphical logos, episodic art, web banners and advertisements, show bios and information, show video clips, audio clips and other information needed on daily basis. The system is secure and all users are tracked for what they download and access and helps management see what promotional campaigns are moving regional demographics to react and promote more aggressively. Shows that are updated weekly include: Bob Villa, CBS MarketWatch, CSI: Crime Scene Investigation (All Series), Dr. Phil, Everybody Loves Raymond, Wheel of Fortune, Jeopardy, Inside Edition, Martha Stewart, Hollywood Squares, Inside Edition, Living it Up! with Ali & Jack, The Oprah Winfrey Show. Our client saves hundreds of thousands of dollars in shipping charges yearly by having needed content in digital formats accessible anywhere in the world. Content is emailed or sent via Federal Express to LSM from sources across the country and then the content is edited, modified, digitized for web use and then uploaded in an urgent manner. LionSky continues to provide technical services for custom changes and weekly web site maintenance services and special events such as Sweeps Week and Holiday Specials.